During school hours, in front of students, Vassar Public Schools held an event which explicitly advocated for a school millage request. A panel that featured a private citizen and a group of administrators was videotaped and put up on the district’s Facebook page. Directed students to the pro-bond website and Facebook page. Talked about the potential for a school shooting if the bond isn’t approved. Reporting from Jones also noted a get-together during the school day at the local library in which school staff were provided with food paid for by the construction company which would benefit from dollars raised through the bond. The staff worked on assignments on how to pass the bond. Jones also notes that Vassar residents have a significantly higher millage rate than citizens in surrounding communities. They pay a total of 37.8 mills compared to people in Frankenmuth (32.9 mills), Vassar Township (22.7 mills), Juniata Township (26.2 mills), Tuscola Township (24 mills) and Denmark Township (25.9 mills). In my view, this is a clear example of a public entity politicking with taxpayer money. While government entities are allowed to provide information about tax requests, they are not allowed to 'express advocacy' one way or the other on the issue. 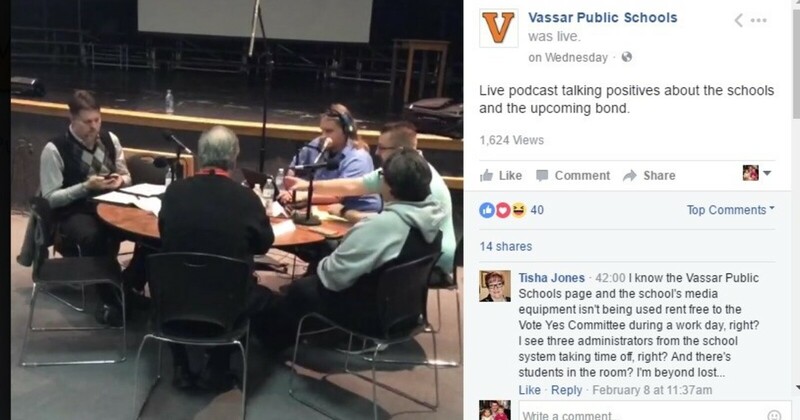 Vassar Schools hosted an event during the school day with public funds which directed people to websites advocating for a 'Vote Yes' position and used only positive language to present strictly the perceived benefits of the bond, rather than a fair presentation of the issues. Sadly, this is just one of many examples of school districts across Michigan that do the same.